Supporting interdisciplinary, problem-oriented student research on the most complex challenges confronting the conservation and management of tropical environments and natural resources worldwide. Training students to be leaders in this area by building linkages across the natural and social sciences and between theory and practice. 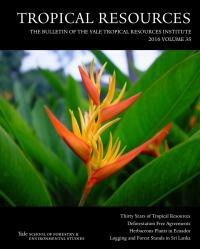 Providing a forum to support and connect the initiatives of the Yale community in developing applied research, partnerships, and programs in the tropics.